When you go on adventures in your RV, it’s important that you have clean water with you at all times. You likely find clean water supplies for RVs to be expensive, so the next best thing would be to obtain water from other methods. This, however, can be problematic, as this water can be hard to drink and to clean with. You will definitely feel and taste the difference between soft and hard water. Hard water will come with metals that taste slightly foul and will irritate your skin. Fortunately, there are water softeners that exist that can make your water healthier and softer so that you can drink it, clean with it, and best of all, enjoy it. In this review, we will take a look at five different water softeners from companies such as ABC Waters, Watts and On The Go. We will explore all their strength and weaknesses, and then declare which softener is the one that you should get for your RV. Comes with a limited parts warranty. Comes with a stable base. Comes with a 360-degree swivel. Has a high grain capacity. Comes with a warranty for parts. On The Go is the maker of our first water softener. Included with this softener is a pair of hardness test strips, inlet and outlet caps, a shut-off valve, a drinking hose and a base for stabilization. This water softener touts 40 percent softer water than any other similar product on the market. If you have other appliances that use water, having water from this softener will also add more years to their lives. Not only is this water good for you, but good for your washing machine and possibly even your dishwasher in your RV. It can regenerate within a half an hour by using two boxes of common table salt. On a regular basis of use, you can get soft and healthy water for around 40 days. This water softener for RVs features a 360-degree swivel for easy connections, so that you won’t have to experience any hassles with the inlet hose or the tank itself. As advertised, the water we get tastes better and you can tell the difference for yourself. It also eliminated slightly bad odors and rust is even less apparent. There is a full cradle base that is included to keep the water softener secure, and this means that it will not tip over or fall when you are driving your RV. Those turns can get rather dangerous, but thankfully the base does its job 100 times out of 100. There is a limited parts warranty that is included with the purchase of the On The Go water softener. This warranty includes the replacement of parts that arrive broken or defective. The greatest flaw with this water softener is the plastic hose and fittings. Since they do not bend that much, they will definitely break when a lot of force is exerted upon them. See if you can buy your own hose and fitting that might be more rugged than what is provided. This next water softener from Watts comes in an all black and shiny body. Included with this softener is a pair of hardness test strips, inlet and outlet caps, a shut-off valve, a drinking hose and a base for stabilization. The Flow Pur water softener is designed to provide high pressure flow rates of up to four gallons per minute with minimal pressure drops. Regenerating is also effective thanks to the drain line flow restrictor that is built inside. With it, up to 50 percent of the water can be retained for future use. The custom-designed flow valved go both ways. On one hand, they make it quick to connect and disconnect from the water softener. On the other hand, it is easy to accidentally disconnect the hose from the tank. This is a nice and affordable water softener. For a reduced cost, you can get softer water at similarly the same size as more expensive products that are on the market. Surprisingly, this tank only weight just nine pounds. It is easy to carry around the RV for even a child, but it is also very light enough to stay secure and planted on a flat surface. This water softener for RVs comes with a one-year warranty. If your softener comes in subpar condition, or you have parts that come defective or broken, you can be eligible for a free replacement. Like On The Go’s fittings, the fitting with this water softener are the worst part about it. They seem to not be tight enough, and you can get little trickles of water coming out here or there. Nothing too serious, but it can really add up in lost soft water over time. Mobile-Soft-water has made this next water softener for your consideration. Included with this water softener are nylon fittings, inlet and outlet caps, a shut-off valve, a drinking hose and a base for stabilization. This softener can treat up to five gallons of hardened water per minute. If there are many appliances that you wish to use at once, like sinks and washers, this is a good water softener to get. It runs to extract soluble iron and total hardness from water. Other metals that it works to remove include calcium, lad, magnesium and radium. The tank itself comes in a nice, electric blue color with a reinforced bad so that it does not fall over unexpectedly. The 16000 grain is high capacity, which matches that of On The Go’s water softener. This softener costs less money, so you will get the same high capacity for less if you go with Mobile-Soft-Water. This is a great water softener to but if you are looking to cut ongoing costs. This softener doesn’t require much power to run, so this softener can shave lots of money off your monthly bills compared to compating water softeners. This water softener only comes with a one-year warranty. While it isn’t that much compared to what other companies are offering, you would still be great that you have it within one year. This is a decent water softener, but unfortunately, if the quality of the water is too low, it can really deteriorate the water softener as a whole, wearing it out faster than you would expect. It is a good water softener to buy if the water you use it with is completely clean. Does not work well with dirty water. ABC Waters is the makers of this next water softener, which is the widest tank in this review. This water softener includes a handle for easy lifting and carrying. This water softener calls for up to 2000 gallons per softened water per regeneration, allowing you to clean with and drink a lot of water before the next time the softener has to generate. This is another energy-efficient model that can save you money on energy bills each month. The softener doesn’t need much power, and with cleaner water going through each of your other appliances, they can run efficiently too. These is only a parts-only warranty eligible with the purchase of ABC Water’s softener. What this means is that if a part comes broken, you can have a new version of that part be mailed to your address. You cannot, however, have a possible broken water softener fixed for you. This is a water softener that is a little too wide and stubby. Is it that really much of a nuisance? No, but waters softeners are made to be as narrow as possible so that they can fit in any space. Perhaps there is not enough room for this softeners to go in the most ideal place inside your RV. What would you do? Is a little bit too wide for storage. Comes with a four-legged cradle. This last water softener is by CR Spotless. Included with this softener is a stainless steel inlet hose, a pre-filled filter cartridge, a four legged cradle, a wrench, a spray nozzle, and a TDS meter. The TDS meter is battery operated, and its purpose is to display how many more gallons of water is remaining before you have to replace the filter cartridge. This water softener comes with a spray nozzle, so you can use this to spray water if you want to clean your car, other vehicle or home. This isn’t ideally used for the water supply in your RV, but you can deionize water and spray it into your water reservoir so that the water you have before your RV trip is 100% clean and soft. The four-legged cradle makes the water softener even more stable than a base, and this also allows you to see the digital readout at from a decent distance without having to hunch or squat down yourself. These is only a parts-only warranty eligible with the purchase of CR Spotless’s softener. What this means is that if a part comes broken, you can have a new version of that part be mailed to your address. You cannot, however, have a possible broken water softener fixed for you. The cradle, however, works both ways. While it does its job at keeping the water softener upright in the RV, it occupies much more space than it if just had a padded base like the other water softeners. Furthermore, this is a rather pricey water softener, and we feel that the extras that are included with it don’t really justify it. Cradle occupies more space than preferred. Not ideal for RV water supplies. What is the water hardness level in your RV? Water hardness is measured in parts per million, or PPM. Hard water is rich in minerals such as magnesium and calcium that are dissolved. When water passes through outdoor elements like soil and rock, these minerals from these elements are taken with them into the water supply. Soft water is consider water that is rated 0 to 75 PPM. Semi hard water is consider water that is rated 75 to 150 PPM. Hard water is consider water that is rated 150 to 300 PPM. Very hard water is consider water that is rated 300 PPM or more. Regeneration time normally takes up to an hour and a half, or 90 minutes, for the regeneration cycle to circulate automatically. However, to ensure how much time is required for your specific water softener regeneration cycle to finish, refer to your water softener’s instruction manual. No two water softeners have the exact same completion time for regeneration. Because salt is needed for water softeners to operate, RV owners will definitely need a substantial amount of salt. 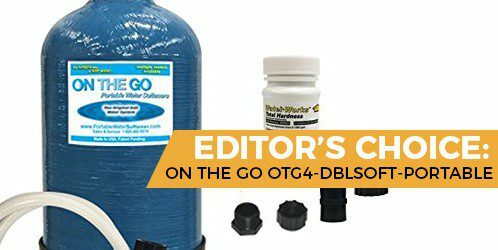 It is important, however, to only use the right amount of it so that you can ensure the best performance possible for the water softener that you have purchased. Be sure that the salt is at the proper levels every time. To do this, refer to your water softener’s instruction manual for advice on what the right pattern is for giving it salt. Some instruction manuals from water softeners may not mention the use of potassium as a substitute for salt, but it is certainly okay to use instead of it, even if it may be more expensive to buy. One thing to keep in mind, though, is that when potassium becomes wet, it will melt faster. When this happens, it can create a bridge development within the water softener. In response to this phenomenon, we recommend adding more potassium than normal when using potassium with potassium chloride. After careful review, the best water softener for RVs is the On The Go OTG4-DBLSOFT-Portable 16,000 Grain. We find that On The Go’s water softener is the most reliable for a number of reasons. It is easy to use in any sort of RV setting, it comes with fittings and peripherals that makes it built to last, and of course, the results we get from out water are phenomenal. It might be pretty expensive for a water softener, but you get a lot out of it, as well as get a lot of use from it, too. The lengthy warranty is a real deal-sweetener, too. Our one concern about On The Go’s water softener is the brittle fittings that it comes with, but you can easily buy new, stronger fittings from your local hardware store that are relatively cheap and abundant. Other than that, you should have clean and soft water for your RV for years to come.